As my number of automated mill processes increased I began to realize that I needed some automation in the clean-up department around the spindle. Although I don’t wander away from the mill very far when it’s operating, blasting compressed air at the cutter by had gets old (and tiring) after 20 minutes or so. I already had run a compressor line and drop to above the mill for hand-use so I split it into a second line for some automatic use. I squared up a piece of 3/4″ 6061 aluminum bar stock with the intention of creating a manifold for the mill. I drilled out the interior of the stock with an appropriate drill for a 1/4″ NPT tap that would match all my compressed air lines. I tapped the end of the hole. 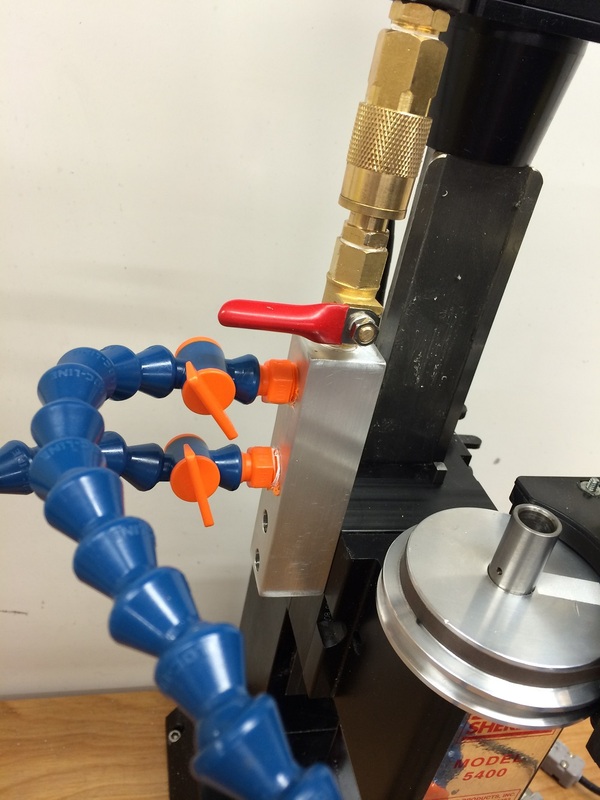 I then drilled and tapped two 1/4″ NPT holes in the side of the bar for Loc-Line flexible hose. I drilled and tapped two 10-32 holes into the Sherline mill’s Z-Axis spacer being very careful not to clip the internal key slots or center alignment pin. Two 10-32 counter-bored holes in the manifold and machine screws hold the manifold to the mill securely, raising and lowering the air lines in sync the spindle. By using a coiled air hose to feed the manifold from my ceiling air line, everything stays safely out of the way of the z-axis hardware. I only used two Loc-Lines to blow air to the table, but there is room enough for four more on the manifold if I ever needed them. At the start of the Loc-Line I included their variable adjustment to allow me to feed each blower with a different amount of air. A ball-valve at the manifold intake allows me to quickly enable/disable the entire system without losing my pressure settings that I’ve already made on the Loc-Lines.